Berlin, October 2011 – The moment of total access to the body through violence is the moment of practising absolute Power/Force. On the one hand the eating of meat is a symbol of dominion and a metaphor for this total grasp, on the other a life is de facto extinguished. That means Power/Force is used in its most extreme form – to assimilate parts of the animal’s body. Hartmut Kiewert´s paintings are an attempt to subvert the blockades of consciousness against the exploitation of animals. The absence and repression of both the miserable life and the dying of animals is countered with the presence of painture, the prensence of flesh-colours. 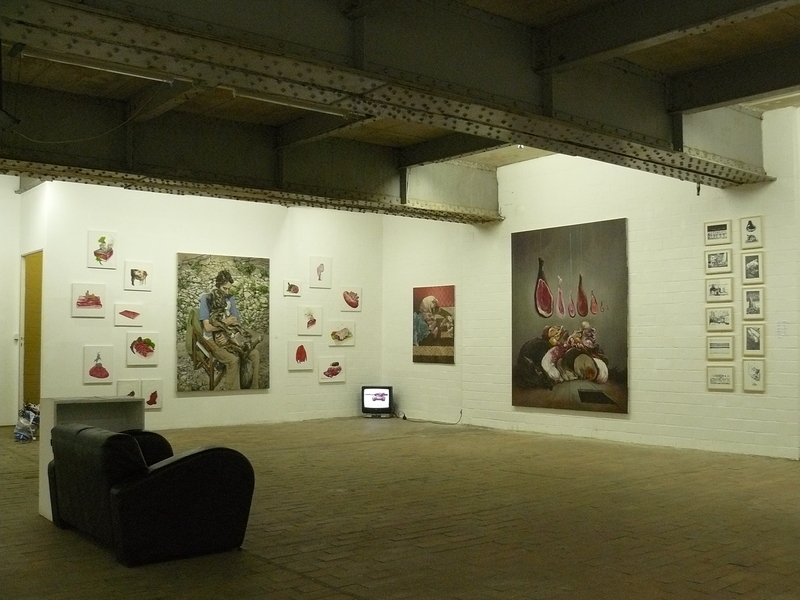 The exhibition »mensch_tier [human_animal]« will be on view from October 22 to November 12, 2011, in G11 Galerie . Thursday-Saturday 3:00 p.m.-7:00 p.m., Sunday 2:00 p.m.-5:00 p.m.
An open salon will take place on Saturday, November 5, 2011, in G11 Galery The evening will include talk by Berlin-based art historian Rosemay on „Animals as trophies in art – Dutch still lives versus Damien Hirst“ (presentation in German language), followed by a moderated discussion. The salon evening presents the second edition »mensch_tier«. The catalogue contains updated essays based on the artist’s diploma work, reproductions of the exhibited paintings and other works. »mensch_tier« will be available in G11 Galery from November 5, 2011, and can also be ordered from the artist via hartmutkiewert@gmx.de.